fertile and wet, but well-drained, conditions. It can handle a range of pH levels.Another excellent VOC remover, the purple waffle plant is an elegantly trailing evergreen perennial in warm to tropical climates. 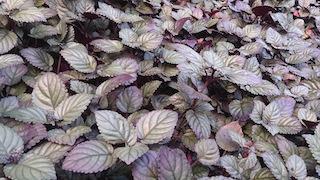 Its purple and silver foliage makes a nice accent plant on a wall garden; it is also used as a fast growing ground cover. Tiny white flowers bloom in spring and summer. The purple waffle plant loves warm, fertile and wet, but well-drained, conditions. It can handle a range of pH levels.